Campsite, specialized in digital media buying, now allows advertisers to effectively target consumers in multiple environments. Pictured: PATTISON Onestop’s Digital Transit Network in TTC subway stations – one of the Networks available on Campsite’s programmatic buying platform. MONTREAL, QC and TORONTO, ON – Campsite Global Inc. announced today that PATTISON Onestop, Canadian leader in Digital Out-of-Home (DOOH) media sales and operations, is the newest supplier to offer its inventory on Campsite. The magnitude of this new alliance makes the programmatic media-buying platform a must-have solution for any advertiser looking to maximize its digital investment strategies. The arrival of PATTISON Onestop further bolsters Campsite through the addition of more than 2,500 screens in over 1,000 new locations-all in three distinctive new environments-giving advertisers unique opportunities to reach their target audiences. 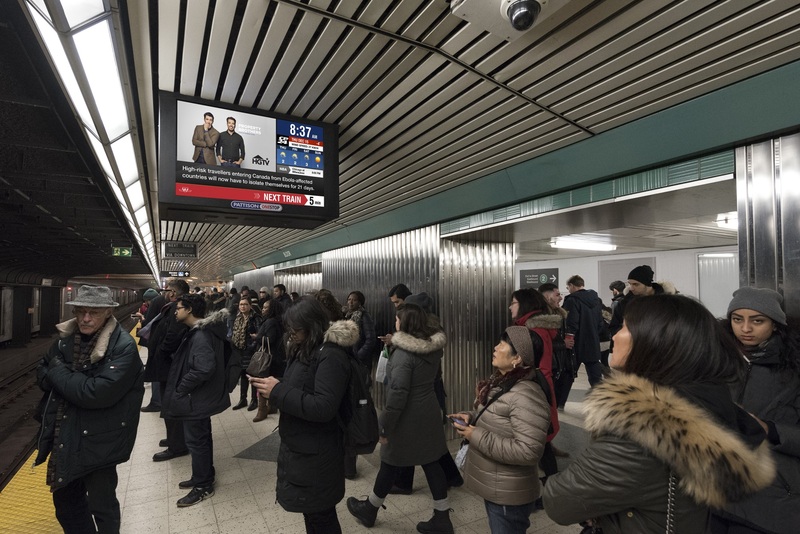 First, the Digital Transit Network, which displays news, weather updates, and real-time arrivals and departures to commuters in Toronto Transit Commission (TTC) subway stations. Next, the Digital Office Network, with its elevator screens in office towers in the downtown core of seven major markets across Canada, enables advertisers to reach professionals, managers, and executives throughout their workday. Lastly, the Digital Residential Network, which delivers content in high-occupancy residential buildings. Campsite’s platform has now officially become a shared playground where the most influential players in the industry can offer inventory through real-time bidding. Leaders in DOOH and place-based advertising, PATTISON Onestop and Newad Media Inc., are the first active suppliers to connect their digital inventory to a shared buying platform. Additional suppliers will be connecting their inventory to Campsite in the upcoming months, further reinforcing its importance in the Canadian digital landscape. PATTISON Onestop is a leader in the sales and operations of Digital Out-of-Home media and works with Canada’s biggest brands to create and deliver uniquely engaging experiences. Their networks provide timely and relevant information in environments traditional media can’t reach. Onestop leverages industry-leading technology to deploy digital campaigns in transit, office, airport, residential and retail environments including the PATH, Toronto’s underground walkway. Their Digital Networks can help you generate over 12.4 million weekly impressions. Onestop is a division of PATTISON Outdoor Advertising.